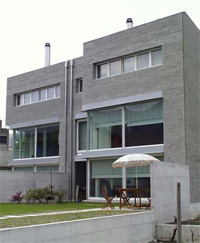 The main goal was to construct a low energy house in respect to economic and ecologic issues. In addition a further supposition of the owners was an attractive and appealing outfit. Of course sustainability and the use of material of the region was granted. It took only 6 months to build this cozy home for one family back in 2001. 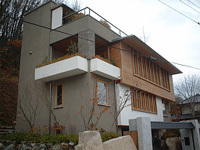 It is of the ecological Passive-house type and is made of pre-fabricated wooden components. The demonstration-project “passive housing” Utendorfgasse 7, A-1140 Vienna” was implemented in a research project founded by the Austrian Government (BMVIT). The goal of the research project is the development of a building concept for the employment of passive technology in social housing. 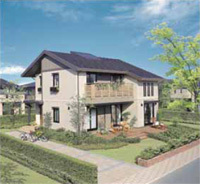 The houses are financed by an semiofficial housing company. 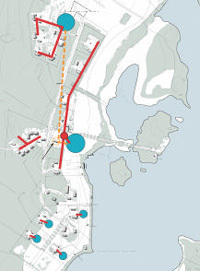 The building project should be finished in 2005/2006. The apartments will be rented. 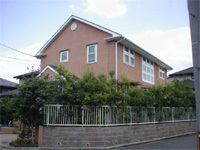 Traditionally shaped, private built, single family house was built in 2003. A building site for this private built house was set by regulating plans, which do not respect optimal solar orientation (in general: when assigning orientation of building, roof type and other parameters, spatial planning does not consider factors of sustainable housing, mainly optimal solar orientation). Therefore, gables had to be south-north oriented and solar collectors had to be placed on the porch. Using a minimum amount of materials and total primary energy from non-renewable sources was the leading idea of the project. The house should reach the low-energy house level with usually accepted costs for standard housing. Both of these facts have led to a wooden-based construction with simple form, energy effective building envelope and use of several components typical for passive houses. The Uvalues of the building envelope are close to those recommended by CSN 730540-2 (2002) Thermal Protection of Buildings, Part 2: Requirements. 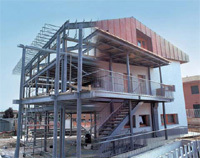 Building envelope is based on a new open woodframed building system Nordic Platform allowing for shorter delivery cycle than with typical construction. Special features of the system are 250 mm wood- frame with thermal break for exterior walls and trussed construction for internal floors. The walls have an air tight additional exterior insulation layer facing air cavity and wooden façade. Insulation thicknesses and corresponding Uvalues including thermal bridging in construction are 275 mm (U=0,15 W/m2K) for walls, 450 mm (U=0,15 W/m2K)for floor with crawl space foundation, and 500 mm (U=0,10 W/m2K) for roof. Windows are triple glazed with one argon gas filled sealed unit and one selective coating. Total U-value including frame is 1,1 W/m2K. 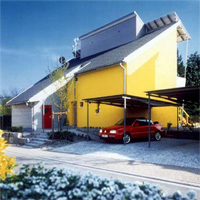 In 1996, a timber-construction double house was built in Durbach near Freiburg within the framework of the "Weber 2001" project. One half of this building was conceived as a low-energy building, the other one as an ultra-low-energy building. The ISIS solar passive apartment block is situated in the recently developed residential area, Vauban, a former military barracks area in Freiburg. 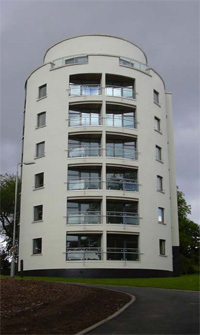 The four story apartment building, which was built within one year, has been occupied since its final completion in June 02. 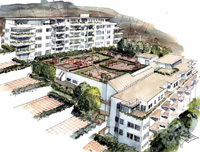 The passive solar apartment block has nine maisonettes and four one-storey dwellings with heated floor areas from 77 to 145 m². The construction of the owner-occupied flats was commissioned by the building group ISIS. The 32 terraced houses in Hannover Kronsberg are arranged in four rows with eight houses each row. This arrangement offers the advantage of reduced envelope surface area to volume ratio. The houses are type buildings which are available in three sizes with 79, 97, and 120 m2 floor area respectively. The apartment houses were built by the GWG, a local housing company for low-income people. The intention was to provide space for young families. The dwellings are rented to the inhabitants. The two apartment buildings with 40 dwellings in total are situated in the redeveloped urban area of Marbachshöhe in Kassel. Up to the late nineties military barracks have been located there. In this brochure one of the two buildings (realized by HHS1) and ASP2)) with 23 dwelling units is described thoroughly. The exterior walls are lightweight timber stud structures. The mineral-fibre insulation layer inserted between the vertical timber studs is 200 mm thick. An additional 85 mm polystyrene insulating layer was applied to the outside of the wall. This layer was plastered in the ground floor area, but sheathed with timber in the top floor area. The wall has a Uvalue of 0.15 W/m²K. In collaboration with major manfacturers of building materials, the municipal housing society (NUWOG) of the city of Neu-Ulm, Germany, raised 3 semi-detached buildings that were designed as 3-litre houses within the framework of a model project located in Ulm. 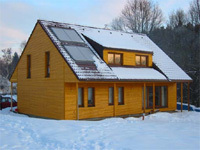 The term '3-litre house' applies to low-energy buildings, whose annual primary energy demand for heating figures below 34 kWh/m²a (including the auxiliary energy required for pumps and fans). The manufacturer of this prefabricated house is expecting a growing demand for residential buildings with an extremely low energy demand in the near future. This is why the company developed this prototype building, designated 'Urban villa', as a 3-litre house. 4-flat detached house with two 60 m2 units (one bedroom) and two 120 m2 units (two bedrooms). Building has two floors above ground, plus basement with storage and parking and attic floor. The house was built by a construction company wishing to realize a demonstration building for lowenergy strategies and light Str/En construction with a relatively traditional appearance. Structure is by Japanese traditional “post and beam” method with 105mm thick wall cavity. To increase insulation thickness and minimize wooden heat bridges, vertical and horizontal bars are attached to make wall cavity thickness 140mm. Outer wall of this house, Hybrid Z, which is a laminated wall of 234 mm thick based on new ceramics (PALC) of 80mm thick, wraps around the whole house. Windows, which have great thermal loss, employ 3-layer glass sash, which improves thermal insulation and air-tightness of housing itself. Realizing a house that is naturally kept cool in summer and warm in winter positively serves to suppress excessive energy consumption in airconditioning. Kankyo Kobo is a prefabricated house, a structure with a high and stable quality formed with steel frames and proof stress panels. All the panel frames, exterior wall materials, heat insulating materials, and window sash frames are preset in the factory. Painting exterior walls is also carried out in the factory in order to avoid the possible airpollution to the surroundings. 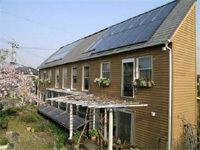 A low energy house with all heat exchange type central air conditioning ventilation systems, passive solar, the photovoltaic system in Kyoto, Japan. This residence is two-by-four structure. Two-by-four structure is the method of construction which was excellent in heat insulation nature and air-tightness from the first. The building is constructed by reinforced concrete to have big thermal mass inside the insulation envelope. The OM Solar system operates on the principle of taking solar-heated air collected under the surface of a building's roof and channeling this hot air, via an interior vertical duct, down beneath the ground floor to a heat-storing concrete slab. This concrete slab warms the ground floor and releases hot air through floor vents for distribution throughout the building's interior spaces. Auxiliary devices come into operation for hot water supply and for backup heating on overcast or very cold days. This home, completed in 2000 and located in a residential district in Maebashi, Gunma Prefecture, is fitted with a power generation system using sunlight. 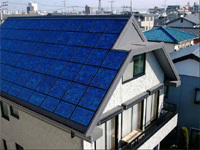 Solar power is a clean source of energy, and unlike oil and coal, is inexhaustible and does not produce CO2 emissions. The home was built with many factory-prefabricated members which were then assembled at site. The foundations are made of foamed concrete. The façades are constructed with a wooden skeleton with 140 mm cellulose insulation and extra insulation of 40 mm cellulose on the inside. The outside finishing is done in deal and red cedar. The inner walls are made of hollow bricks, for their low mass and for the in-wall heating. As a result of the fact that this project is built in the body of the dike which is constructed on more than 15 m of soft peat ground below sea level, and because of the pressure on the dike caused by heavy rainfall upstream on the rivers Rhine and Meuse, it was necessary to make the concrete pile foundations extremely heavy. The light weight concrete main structure of the extended walls is covered with 300 mm EPS insulation and finished with a mineral plaster (u=0,115 W/m²K); insulated window frames, windows and doors (u=0,68 W/m²K), together with integrated sun shading systems in the large south and west facing windows; 300 mm EPS roof insulation (u=0,116 W/m²K) on the roof and 300 mm EPS insulation on the floor (u=0,113 W/m²K) make a perfect insulated envelope around the living areas of this passive house of which the exterior building connections are designed to avoid thermal bridges. 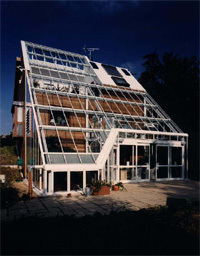 All the houses use passive solar effects for space heating purposes, optimised by their design. One has a Stirling engine, used experimentally (it burns gas, which produces electricity and hot water); this same house has a heat recovery system. Several measures will be carried out to improve the building envelope compared to normal building standard. All of these actions are optimized in the regard of energy and cost efficiency, and the total concept is crucial for the good result. Several measures will be implemented to improve the building envelope compared to normal building standards. These measures are optimized as regards energy and cost efficiency. The building is an evolution of a design used previously by the design team and this gives it a key advantage. The building holds a specific grid layout and has a habitable roof space to reduce costs and reduce site waste. The building, which is circular, is not contemporary to the area but has a key advantage. It has a low impact on the surrounding area as it has a small and compact plan area. It is also reminiscent of Brochs and medieval tower designs prevalent around Scotland. The floor construction consists of 100 mm concrete, 350 mm polystyrene and 200 mm macadam. The U-value is approx. 0,10 W/(m²·K). The external walls consist of 450 mm polystyrene and mineral wool divided in four different layers. 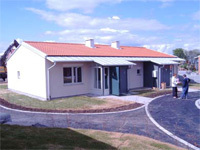 In an environment of great natural beauty at Lindås, 20 km south of Göteborg, the city owned company Egnahemsbolaget has built 20 terrace houses in which a traditional heating system has been replaced by a heat exchanger in combination with an exceptionally well-insulated construction. The objective of this project is to minimise the energy consumption of the building while providing a living space with highest comfort and quality. 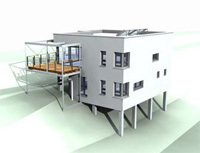 The building is planned as a complete system including all necessary energy measures for a passive house. The builders requested an optimised annual energy balance, a smart combination of passive and active solar energy use, modern and ecological construction as well as a conservation -conscious design of the site. The structure of the house is massive. Each floor is a concrete slab construction. Part of the walls is also made of concrete. In order to reduce the number of thermal bridges, the house bearing structure is built inside the polystirol insulation envelope (13 to 20 cm of insulation thickness). The project was wrapped in: good architecture, trendy design, way of living, family values, happy and healthy children, a lot of green spaces, health focus and being responsible for the next generation. The walls, ceiling and flat roof are of wooden frame lightweight construction. The entire envelope is free of thermal bridges. Cellar, underground parking and the staircase for the exterior access are built in concrete. 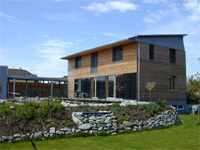 Ventilation is provided by opening windows in the external wall and glazed doors between the house and the conservatory. In addition, each house has a mechanical ventilation heat recovery (mvhr) system that supplies fresh air to living/bed rooms and extracts from the kitchen and bathroom. In 1998, housing association ‘Housing Solutions’ approached INTEGER with a scheme for a site in Maidenhead. The aim was to incorporate as many INTEGER elements of innovation in design, intelligence, environmental performance and construction process as possible in order to maximise the benefits to the future occupants. Materials for the building fabric were selected for sustainability, low embodied energy, long life and low maintenance. A low maintenance turf roof provides good insulation, is visually attractive and provides a natural alternative to conventional roof materials. 4” Structural Insulated Panels (SIPS) along with 1” EFIS (exterior finish insulation system) were selected for wall panels because they were less expensive to build and were 15% more energy efficient than standard stick built 2X 6 construction. Walls as constructed have a U value of .05 or R-22.